Subject: Plate 6: 'Gemischt - Alterthum.' 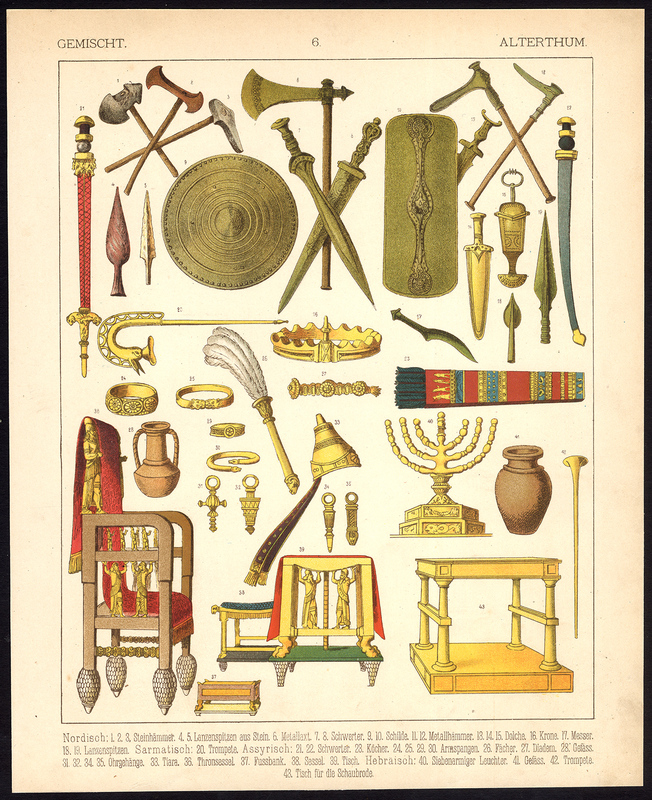 This plate shows artefacts/objects from various ancient Middle Eastern cultures; weapons, relics, jewellery etc. Condition: Good. General age-related toning and light staining/soiling from handling as visible on image. Please study scan carefully. Medium: Chromolithograph on vellin paper. Size (in cm): The overall size is ca. 23.5 x 28.5 cm. The image size is ca. 20 x 27 cm. Size (in inch): The overall size is ca. 9.3 x 11.2 inch. The image size is ca. 7.9 x 10.6 inch. Description: This antique print originates from 'Die Trachten der Volker, vom Beginn der Geschichte bis zum 19. Jahrhundert' by Albert Kretschmer. Published 1882 by J. G. Bach in Leipzig, Germany. The second edition with 104 chromolithographed plates depicting costumes of the people of the world from ancient history to the 19th century. Artists and Engravers: Artist: Albert Kretschmer (1825-1891) was a German painter, professor and costume researcher, as well as chairman of the Schauspielhaus, Berlin. Author: Carl Rohrbach.